Recently, I met an exceptional marketer. She described the purpose, strategy and tactics of a marketing department remarkably succinctly. Marketing’s methods can seem intangible. But she explained them simply and elegantly. I drew the chart above based on her vision of marketing’s roadmap. At the highest level, marketing articulates a compelling narrative. This is step 1.The narrative brings the market forward by contrasting the current state of affairs with a persuasive view of the future. This is a Gap Analysis - a comparison of the current state of affairs to the desired potential. The narrative may have several parts, and it will evolve as the market changes. Salesforce started marketing No Software and Sales Force Automation; a vision of the future without CDs to install or update software, which maintained up-to-date sales pipelines. Today that narrative is much broader and spans future views of marketing, support, data analytics and other spaces. Once the team establishes the narrative, persona creation is next. There are several key people in a sales process. Identifying the top three or four is critical. Next the narrative is mapped to the personas. Identify the pain points associated with the status quo impacting each persona. Then create marketing content to educate each of these personas about the benefits of the future, through the key parts of the customer journey. I’ve depicted four steps, but these depend on each startup’s buyer. Last, syndicate these messages through multiple channels to maximize reach. Search, social, speaking events, books, webinars, analysts, field marketing and others. Ultimately, these efforts should result in leads and accelerated sales cycles because the buyers understand and resonate with the future vision. 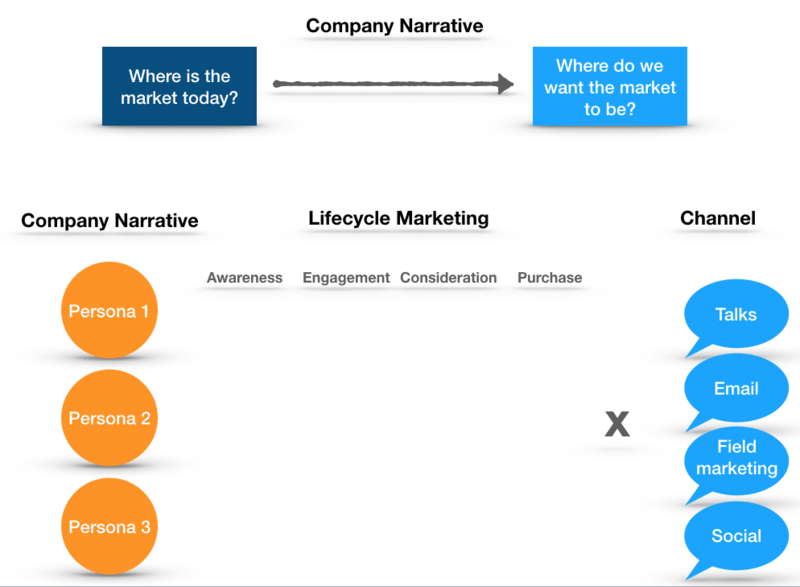 Lead generation velocity and sales cycle metrics should be used to determine the effectiveness of the narrative, persona identification and lifecycle marketing efforts. In my experience, this marketing framework is unique in its simplicity and combination of strategy and tactics. 1. If a product doesn’t have that potential, the startup isn’t focused on an important problem. Sales cycles will drag. Price points will languish. Growth will be challenged.